Of course, all three of these categories are important, but for early-stage startups, everything hinges on #1 — and in order to get more customers, we need to generate qualified leads. At Hubstaff, we’re reaping the benefits of a long-term investment in lead generation, driven by SEO and content marketing (this blog is part of that effort). The impact has been huge: we’ve had 1,490 new free trials in the last 30 days alone. Driving new leads is only part of the equation, though. For a SaaS company like Hubstaff, our ability to convert these leads into customers leans heavily on the performance of our trial. Generating traffic and leads is great, of course, but all that time and effort is wasted if nobody buys at the end of our trial. In this post, I walk through the process we’re using to improve our SaaS free trial and increase our conversion rates. The journey hasn’t been perfect, and we’ve made plenty of mistakes, but if you haven’t put much thought into your free trial, you should be able to learn a thing or two about what to do (and what not to do). That last point about “desired outcome” is important, and one we try our best to keep in mind at Hubstaff. Our customers don’t really want to track time; they want insights into how their team’s time is being spent so they can save more time or make more money. 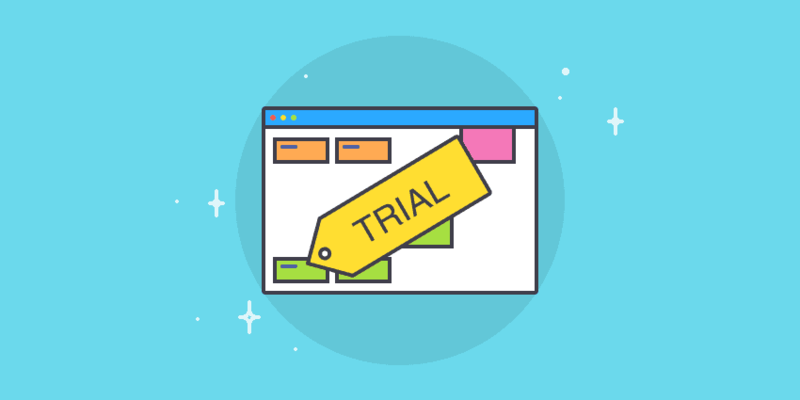 Our goal is to help free trial users achieve that outcome as quickly as possible, and once they’ve achieved that (or seen how they could), we have to reinforce those benefits, and deepen engagement to maximize their chance of converting. Hubstaff helps people keep track of how much time is spent on different projects. In order to do that, users first need to set up their projects so that they have something to track time to. We have looked into ways to get users to start tracking time without needing to create a project first, but for now, it is a requirement that we need to work with. Typically it is a manager or owner who starts the trial, and while many do track their own time, their ultimate goal is to get better insights into how their employees and contractors are spending their time. In order to do that, they need to invite those users into Hubstaff. Now that the team is onboard, they can start tracking time. Remember, time tracking is the “meat and potatoes” of Hubstaff, but the real value of the software lies in improving the user’s business processes, so we haven’t gotten them to their desired outcome yet. This is the value step, and its importance cannot be overstated. This is the “aha!” moment, where the user can see exactly what their team’s been working on, how active they’ve been, and even view screenshots. It’s at this point where users can immediately see how easy Hubstaff makes staying on top of your team. No more spreadsheets, no more guessing. Just accurate data, all in one place. Getting the user to that “aha!” moment is crucial to the success of the trial, but we don’t want to stop there because there is more that we can offer. 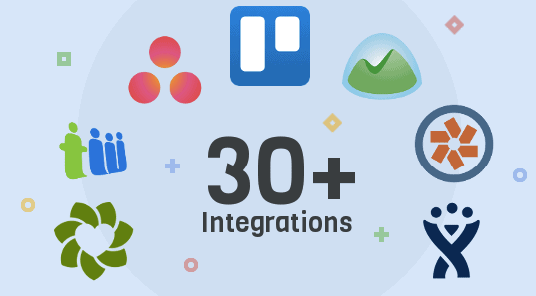 Once they’ve seen the value from our reporting, we want to show them how easily they can tap into their current workflow using our seamless integrations with 30+ popular project management, payment, accounting, and help desk services. Of course, that’s just part of the story. Each of these five steps is reinforced by an automated email sequence designed to increase engagement and, ultimately, convert the lead to a paying customer. If a user hasn’t taken a necessary step for success (maybe they haven’t invited the team, started tracking time, or viewed reports), we follow up with an email asking for feedback and offering assistance. Taking a cue from #5 and #6 above, we emphasize benefits here. We lead with “here’s what you’re missing out on,” then ask how we can help take advantage of these features. I’ll be honest. The feedback we receive isn’t always positive, but it is always helpful. When we first started out, we heard from a lot of users who said we were sending way too many emails. That wasn’t exactly fun to read after spending so much time creating the emails, but it really helped us fine-tune our approach. Trying to improve trial performance without asking for user feedback is like throwing darts blindfolded: you might hit the bulls-eye eventually, but you’re not doing yourself any favors. Just make sure you don’t go overboard by being too persistent (we’re still trying to find that happy medium). Sometimes, it’s the little things that make all the difference. When the trial starts, we send out a quick email from Dave, our founder, to welcome the user and ask why they signed up. People respond to this email all the time, and Dave loves getting these responses because it gives him insights he wouldn’t otherwise have gotten. Many of them simply express appreciation that the founder is making himself accessible. We also hear what our users are hoping to accomplish, and we use this feedback to help them get there. As a bootstrapped startup, we don’t have a team large enough to offer everybody hands-on help when getting started, but if a user reaches out for help, we respond. This kind of “quasi-concierge onboarding” has helped us personalize the user experience at scale while capitalizing on the advantages of automation. By now you’re probably noticing a common theme here: user feedback. Without a doubt, user feedback has been the single most important factor in improving our free trial. The exit survey is a big part of that. Sometimes “X” is something we don’t offer and don’t plan to offer. This helps us fine-tune our marketing to help people understand exactly what Hubstaff is before they start the trial (many people want a simple, personal productivity tool but that isn’t our focus). Often times, though, “X” is something we have, so we can then offer to extend the trial and show them how to use it (maybe they don’t know we have iPhone and Android apps). On the design side, we also take this sort of feedback and use it to improve the UX so future users can find these features more easily. It’s not all sunshine and roses, though. We continue to make mistakes along the way, but we try to learn from them as best we can. Email automation is great for streamlining our free trial engagement strategy, but we’ve had a few hiccups along the way. Our “invite the team” email, for instance, is supposed to go to people with at least 2 members on their team, but we discovered it was only going to those on teams of four or more. Not a major mistake, but if you are going to be using Hubstaff with a team, regardless of the size, we want to help make sure you get them onboard. We also send out reminder emails to users whose teams haven’t tracked any time (meaning they haven’t been using the software). 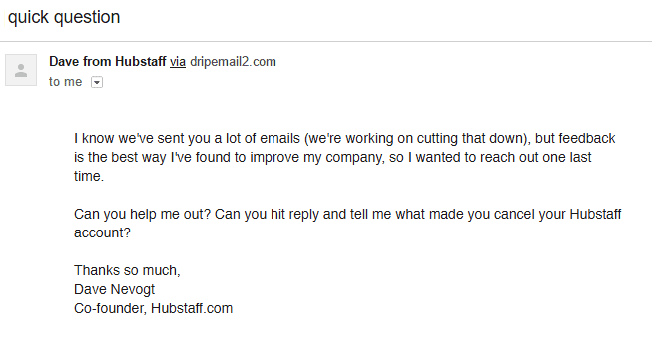 When we first launched our email sequence, that email was going to everybody, even if they didn’t have a team. That was a bit embarrassing. We know that Hubstaff can help our users save time and make more money, but that it isn’t always obvious to them how we can do that which is why we designed the path to their desired outcome. When we started, we wanted to do everything we could to help the get on the right path, but that meant sending a ton of emails. To be blunt, we wanted to be helpful but were coming across as annoying and knew we needed to change our strategy. Our approach to finding the right balance is twofold: we’ve reduced the total number of emails in the sequence, but we’re also working hard to better personalize our emails to the unique wants and needs of each individual user. It’s a balancing act, because regardless of how many emails you send, you’re going to annoy somebody. We know we can provide value to most of our users and want to help demonstrate that, even if we have to send a few more “nudges” than we are comfortable with, but we need to make sure we don’t go too far. A good subject line is critical to improving email open rates, so we’re constantly A/B testing our subject lines to see which ones users respond to best. Through our experiments, we’ve found that clever “clickbait” subjects get high open rates, but they also piss people off. People don’t want to feel like we are tricking them and we don’t want our brand associated with that, so we have changed our tactics here. At the end of the trial is when we summarize the benefits and make the pitch to upgrade to a paid plan. If users don’t open these, it will have a direct impact on conversions because they won’t see the pitch. Right now our open rates on these 2 emails are relatively low. Improving our free trial is an ongoing process, and if we’re doing our best work, it will never be complete. Right now we’re in the process of rolling out changes to fix the bugs, limit the emails, and change clickbait subject lines. Future free trial improvements will continue to incorporate user feedback, A/B test subjects, and change how we pitch based on user activity. For our most active trial users, we want to send a pitch before the trial ends, but if they haven’t been active, we want to keep educating them. We’re also excited to start experimenting with webinars, which we’ll be adding at the beginning of the trial as a more personalized way of familiarizing people with the software. I’ll dig into that in a future post — stay tuned. What strategies have you found most effective at improving your SaaS free trial conversion rate? Share your experience in the comments below!